An eye- catcher in any kitchen: exclusive design and premium materials. 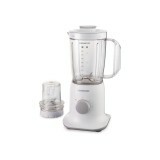 ..
About the Super Compact Blender BL227 If you're a cook with big ideas and a small kitchen, the super-compact, white Kenwood BL227 Blender will always work for you. 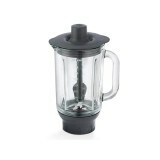 It may look small, but you'll find it's a big help for in creating smoothies, soups and sauces in seconds. Our True r..
Powering your healthy lifestyle Combining a busy lifestyle with the desire to live a healthy and active life is an everyday challenge in today's world. A smoothie or soup is often the easiest way to get more fruit and veg into our diets. 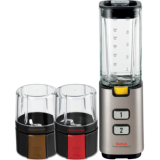 The new Kenwood Blend-X PRO is here to help, wh.. The innovative stir stick efficiently mixes even really thick recipes and the unique MultiZone blades can blend everything from soft fruit to ice. A great attachment that can be used on all Chef and Major kitchen machines, even Cooking Chef. .. 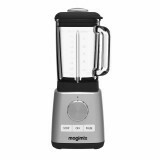 The BlenderMix system by Magimix guarantees an ultra-fine blend for veloute soups, smoothies, desserts, and even crushed ice. With four pre-set programmes, making the perfect blend is just a button away. 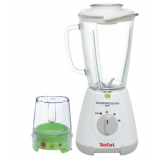 The 1.8L thermo-resistant glass jug can withstand high and low temperatures, allowing yo..
Mayer MMNB1000 Nutri Blender The NutriBlend 1000 Blender is versatile and compact, making it perfect for those on the go. It makes light work of crushing ice, chopping and blending as well as nutrient and vitamin extraction. 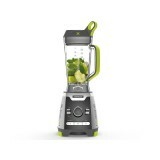 With 1000W power the NutriBlend 1000 Blen.. The power switch is designed to prevent you switching power on accidently. 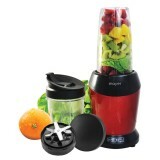 With sharp, durable long-life cutting blades that let you enjoy smooth, easy-to-drink fresh juice. It also lets you easily grind coffee beans and spices, and chop nuts, for more cooking versatility. S.. 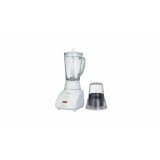 Ultimate mixing with Blendforce Maxi blender With Blendforce Maxi blender, enjoy the ultimate in blending strength. Thanks to Tripl'Ax Technology, no chunk is left behind, for smooth homogenous results. 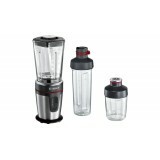 Featuring 6 stainless steel blades and 3 simultane..
Blendforce Tripl'Ax blender: The ultimate in strength With Blendforce, enjoy the ultimate in blender strength, thanks to its innovative Tripl'Ax technology, combining 6 stainless steel blades with 3 complementary actions to deliver perfect results every time, no matter the ..
Blendforce Glass: Ultimate Blending! 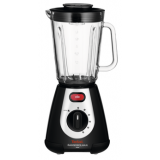 Tefal's Blendforce Glass blender uses 6-blade Tripl'Ax Technology to deliver optimum blending performance. 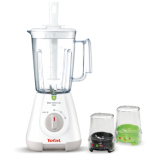 It features 2 upward serrated blades which act like a cyclone booster so that no pieces are left behind, plus 2 downward sharpened..
Total ease with Click and Taste mini blender! 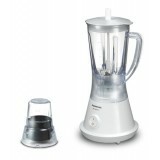 With Click and Taste mini glass blender, enjoy total convenience thanks to a compact design and practical features. Changing attachments and storage are both made easy, while clean-up is a breeze thanks to the Click a..